Set Instant Pot to Saute and add 1 tablespoon of oil. Saute onions, garlic and jalapeño until onions start to soften and turn translucent, 2-3 minutes. Add chicken broth, tomato sauce, chili powder, sugar, cumin, salt and pepper to Instant Pot and stir to combine. Add chicken breasts to Instant Pot, close lid and set pressure release valve to Sealing. Set Instant Pot to High Pressure via Manual Mode for 10 minutes. Instant Pot will take about 10 minutes to come to pressure, then will countdown from 10 minutes. While chicken breasts and sauce are cooking, shred cheese and combine and prepare tortillas. To prepare tortillas, preheat oven to 400 degrees. Brush tortillas lightly with vegetable oil, spread on a baking sheet and heat in oven for about 5 minutes, just until soft and pliable. Once Instant Pot has completed 10 minute countdown, it will beep and switch to Keep Warm function. Carefully turn preesure release valve to venting to Quick Release pressure. Remove chicken breasts and set aside to cool, then shred. Stir 2 tablespoons of chopped fresh cilantro into enchilada sauce. Spray a 9x13 baking dish with non stick cookings spray. Use 1/4 cup of enchilada sauce from the Instant Pot to spread on bottom of baking dish. 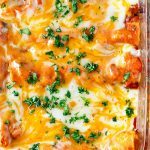 To assemble enchiladas, evenly divide 1/2 of enchiladas sauce, 1/2 of shredded cheese and all of the shredded chicken among the 12 corn tortillas, roll and place seam side down in baking dish. Pour remaining enchilada sauce over rolled enchiladas and top with remaining cheese. Cover dish with foil and bake at 400 degrees for 20-30 minutes, or until heated through and hot and bubbly. Sprinkle with additional fresh cilantro and serve with sour cream. To convert recipe to slow cooker, sauté onions, garlic and jalapeño on stove top, then transfer to slow cooker. Add chicken broth, tomato sauce and spices along with chicken breasts to slow cooker and cook on high 3-4 hours. Follow assembly instructions above.